Ty Montgomery's fumble on a kickoff return with two minutes left after the Los Angeles Rams retook the lead cost Aaron Rodgers and the Green Bay Packers a last shot to knock off the NFL's lone remaining unbeaten team on Sunday. "That was a tough loss, a hard-fought loss," Green Bay coach Mike McCarthy said. "The big plays, the back-and-forth, it's a tough one to swallow. It really comes down to the critical plays there at the end of the game and we couldn't overcome it. Tough one." Rodgers completed 18 of 30 pass attempts for 286 yards, but he was unable to get on the field with the Packers offense in the last 5:20 of the game. After Marque Valdes-Scantling's 40-yard touchdown pass from Rodgers put the Packers up, 27-26, in the fourth, the Packers' defense got a significant stop when Clay Matthews recorded the team's fifth sack of the day to get the ball back to Rodgers with 6:49 left. Todd Gurley broke off a 23-yard run on third-and-6 to set up the go-ahead field goal for the Rams. Montgomery's costly fumble followed on the ensuing kickoff. Los Angeles' Ramik Wilson forced and recovered the fumble for Los Angeles. "Very disappointing," Rodgers said of the fumble on the kickoff. "That play didn't lose the game, but it definitely took away an opportunity for us to go down and win it." Montgomery caught the ball two yards deep in the end zone and decided to come out with it, but then didn't protect it. "The plan was to stay in (the end zone) and give the ball to Aaron Rodgers," said McCarthy. 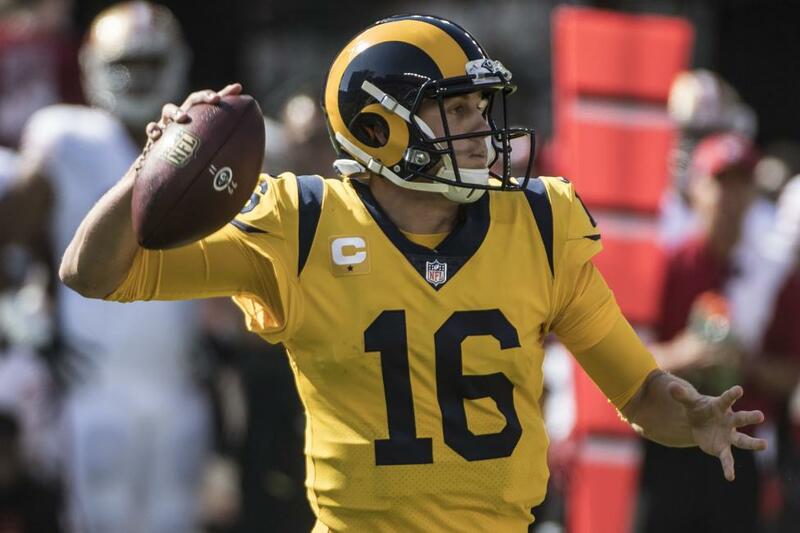 One of Rams quarterback Jared Goff's three TD passes was to Gurley when he got free over the middle for a 30-yard score. He had six catches for 81 yards while Josh Reynolds caught the other two touchdown passes from Goff, who went 19-of-35 for 295 yards. "That was probably my favorite win of the year," said Goff, who did not have an interception. Green Bay's defense stopped the high-powered Rams on their first five possessions before they got going. The Rams' special teams pinned the Packers inside their own 5-yard line twice on punts, the second time resulting in a safety followed by a touchdown before half that got the Rams back within 10-8 at halftime. Green Bay's Devante Adams had two catches of 40-plus yards on his way to a five-reception, 133-yard day, and Aaron Jones' 33-yard touchdown run on a draw play highlighted his 86 yards on 12 carries. "Coming off the bye week, we had extra time to prepare for the Rams, and we were ready to play," McCarthy said. "It's probably the first time in a while we've been healthy. "Critical plays at the end of the game, that's what it comes down to, and we didn't make them." Gurley's touchdown reception extended his touchdown streak to tie the Rams' record set by Elroy "Crazylegs" Hirsch in 1950-51. Gurley leads the NFL with 15 touchdowns, and he became the fourth player in league history to score at least 15 touchdowns in the first eight games of a season, joining Jim Brown (17 in 1958) and Priest Holmes (15 in 2002 and 2004). Veteran Rams defensive back Sam Shields played well against his former team. He caught a pass from Johnny Hekker on a fake punt, and he later downed a punt at the Green Bay 1 to set up the Rams' defense for a safety. Shields played seven seasons with the Packers before his fourth concussion in 2016 nearly ended his career. He returned to the NFL with the Rams this season. Both teams are on the road next week. The Packers travel to New England for another marquee matchup and the Rams take their unbeaten record to New Orleans.